With every delivery we always have those special pieces. The ones that you know will fly out the door, every customer will want! And even if you order 2 or 3 per size, it will still all go! Bar one! That ellusive one! That one size that for whatever reason does not sell! It doesn't make any sense because its not a specific size, it could be a tee in a size 3 and shorts in a size 6 (by the way our two most popular sizes!). It just doesn't make sense! Those in retail will know exactly what I am talking about! We have learned to accept it and not try to analyze it too much! Because of the above reasons we have decided to clear our "Last of the best sellers!". 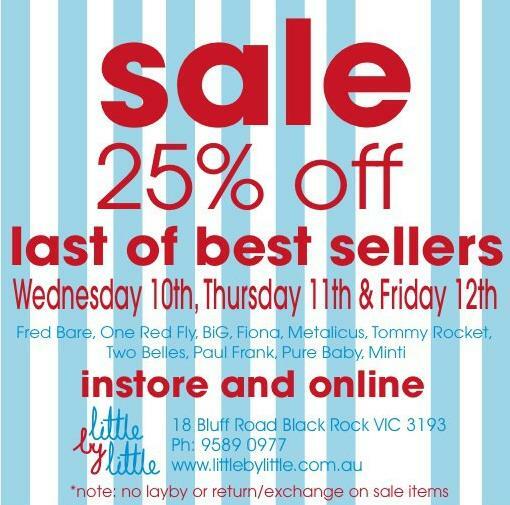 Across all brands, Fred Bare, One Red Fly, Two Belles, Tommy Rocket, Munster, Minti there are those sizes specific sizes that aren't going anywhere so you get to save! There are some pieces that only arrived last week, our we have had for months, it doesn't matter! We want you to save save save! So drop in Wednesday, Thursday and Friday and enjoy 25%Off across those pieces!